DIRECTION: ORTIGOSA-CANTO HINCADO. Ortigosa de Cameros (00 min) Leave the village from San Martín Church, next to the viaduct. Go up Solano street and then Subida al Castillo street, until you reach the outskirts. At the last houses, take the trail on the left, next to a light post and a handrail, and after a few metres you will reach a trough, from where the trail descends toward the Rioseco Stream and continues parallel to it. After about 20 minutes, exit the trail to the right and cross the stream. Follow the trail until you cross a bridge, ignoring a by-path on the left. Turn left at a rocky slope and take the old path. Path to Brieva (51 min) The path ascends among pastures and then enters a beech grove. Ignore a lane that descends to the right and after 14 minutes you will reach the Rioseco Stream. Rioseco Stream (1 h 05 min) Cross the channel and zigzag up among pine trees. After about 15 minutes you will access a by-path where you will turn right. After a steep stretch, you will reach a flat area with a trough. Trough (1 h 19 min) After the trough, exit the by-path to the left and cross the pastures towards the southwest. Continue up a well-market path among pine trees until you reach a hill with a fence. 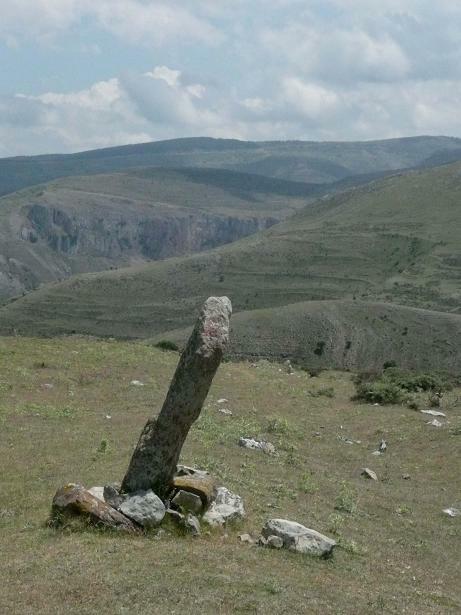 Collado de Canto Hincado (1 h 34 min) On the hill, a great rock marks the boundary mark between Brieva and Ortigosa. There are great views of both valleys. DIRECTION: CANTO HINCADO-ORTIGOSA. 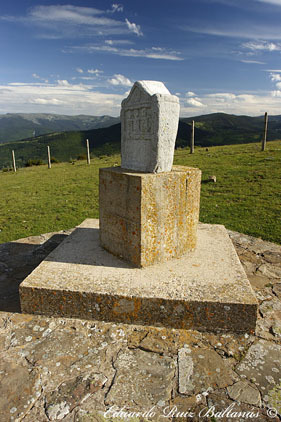 Collado de Canto Hincado (00 min) On the hill, a great rock marks the boundary mark between Brieva and Ortigosa. There are great views of both valleys. Cross the hill on a cattle grid and descend on a path to the left that enters a pine forest. After 10 minutes, you will reach a flat area with pastures. Cross towards a trough until you reach a by-path. Trough (12 min) Follow the steep by-path down and, after about 100 metres, when it traces a curve, leave it and take the route on the left that zigzags down between pine trees. After a steep slope you will reach a stream. There is a beech grove next to it. Rioseco Stream (24 min) Cross the channel and descend next to the right river bank among beeches. The path, when the forest clears up, ends at a forest trail. Forest trail (36 min) Turn right and continue on the trail. Cross a bridge and descend next to the right river bank of the Rioseco Stream. After about 20 minutes, ignore a trail on the left that goes towards the stream. After passing a dunghill, next to the river, the trail ascends to a trough at the outskirts of the village. After the first houses, the streets lead you down to the town centre. Ortigosa de Cameros (1 h 22 min) End of the stage and connection to the main route. DIRECTION: EL HOYO-VILLOSLADA. Despoblado del Hoyo (00 min) At the footpath crossing, near the remains of the Hoya Chapel, descend to the right in southwest direction towards a stream. Cross it and ascend a steep path until you reach a flat area with pastures and a semi-collapsed stone wall. Continue walking next to a wall down a narrow footpath until you reach a trail. Trail (20 min) Cross the trail and continue next to the wall. You will cross another badly marked trail. 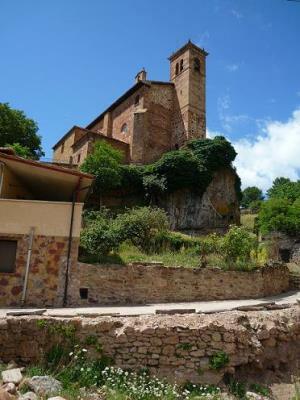 You will sight on the left the Chapel of Ollano. Descend along the edge of a wall until you reach the pastures at the bottom of the river bed, next to the hill. Pastures (25 min) Leave the wall and turn slightly left. Ascend among oaks towards an elevation and descend parallel to a trail (leave the trail on your right) until you reach a stream. Stream (36 min) Cross the stream and continue through an oak wood that has a smooth ascent. Cross a gate at the boundary mark between Villanueva and Villoslada and access, after a few metres, a fire lane. Fire lane (46 min) Great view of the Cebollera Mountains. Cross the fire lane next to a milestone and continue the by-path down the flat area. After a small steep slope you will arrive at another flat area with a pine and Pyrenean oak forest. When reaching the road, turn slightly left and the by-path will become a route that runs parallel to the road. After about 200 metres, the route crosses the road. Road (1 h 07 min) Cross the road and continue straight on a footpath parallel to the road, but on its right. When you reach a split in the path, take the one on the left until you reach a by-path under a light post. By-path with light post (1 h 20 min) Great views of Hoyos de Iregua and Villoslada. Follow a by-path to the right. It will soon become a path next to stone walls and pastures. When you reach a paved trail, descend to the village and enter next to the San Miguel Chapel. Villoslada de Cameros (1 h 43 min) Continue descending straight, always on the left, and you will reach the City council. DIRECTION: VILLOSLADA-EL HOYO. Villoslada de Cameros (00 min) Turn right and go up San Miguel street. Pass next to San Miguel Chapel and arrive at a trail crossing. Go up the paved trail until you reach the cemetery and, before reaching it, take a path on the right that continues on the hillside along walls and pastures. After a milestone, you reach a by-path under a light post. By-path with light post (28 min) Turn left and, after a few metres, take the route to the right that continues on the hillside parallel to the road until it crosses it. Road (41 min) Cross the road and take a parallel footpath on the right side. After 5 minutes, you will reach a by-path. Continue on the by-path, moving away from the road, and cross a flat area with a pine and Pyrenean oak forest. Before a small descent, you will see in the distance the Chapel of Ollano and the Serradero Peaks. Cross another flat area among oaks and you will reach a fire lane. Fire lane (58 min) Cross the fire lane next to a milestone and continue to the left along a fence until you reach a gate, at the boundary mark between Villoslada and Villanueva. After crossing the gate, the path descends to a stream. Stream (1 h 06 min) Wade across the stream and go up to continue on the old path that runs parallel to a trail on the right. You will reach an elevation and turn left slightly to descend towards the pastures. You will pass next to a trough. Ollano Pastures (1 h 18 min) From the edge of the pastures, the path ascends next to a stone path. 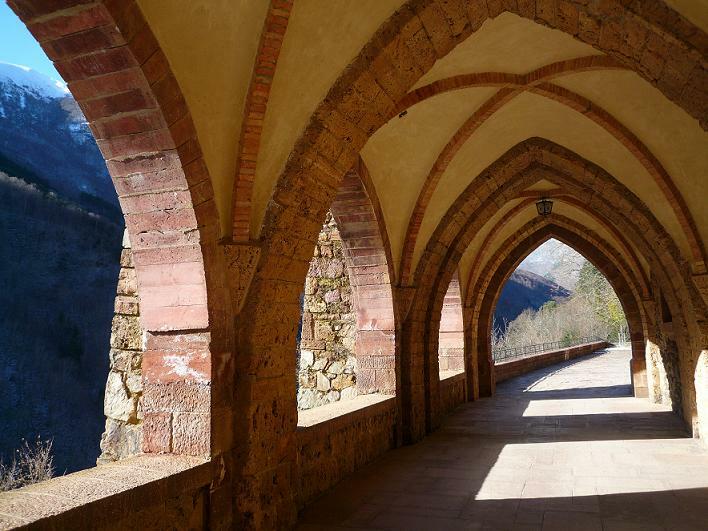 After 5 minutes, you will sight the Chapel of Ollano to the right. Continue next to the stone wall and, after crossing a badly marked trail, you will reach another trail. Valvanera Monastery (00 min) Exit through the door of the inn and take a path above a fountain. After a few minutes, cross a door that gives access to a house in the forest and turn right after passing a gate. Continue the path bordering a fence. After a few metres, turn left and go up a path that penetrates into a holm-oak wood. Pass a water deposit and an apiary, and turn right when you reach a trail. Forest trail (13 min) Continue going up the trail, where a pronounced curve starts. After passing the second ravine, leave the trail for a steep fire lane. By-path in the pine forest (47 min) At first, ascend a steep stretch on the fire lane. Then, exit the lane on the left and enter a by-path through a pine forest, where the slope is smoother. 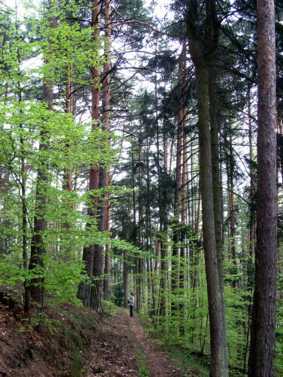 Cross a trail and continue straight on a by-path until you reach the end of the pine forest. Fire lane (1 h 07 min) Turn left and go along the edge of a pine forest on a fire lane once you have reached the summit area. This will lead into a trail. Continue ascending on the trail and, after a steep stretch, you will arrive to another trail. Connection of the forest trail to Ocijo (1 h 30 min) To the right, the footpath goes to Ezcaray. 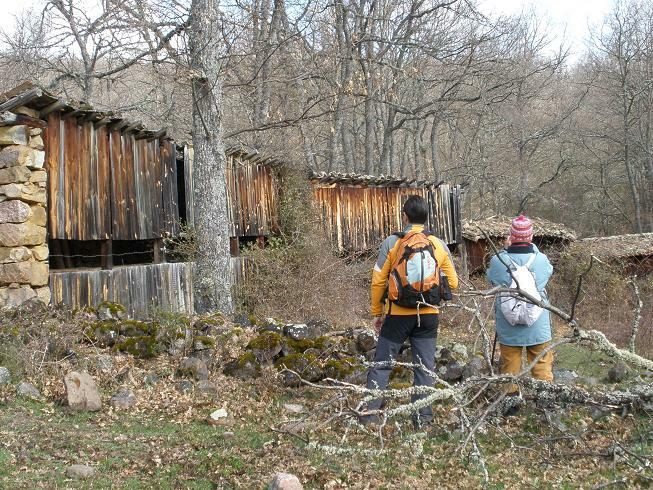 Continue on the trail towards the left and after half an hour (2.4 km) you will arrive at the hill of Ocijo, where there are several hunter shelters. Collado de Ocijo (2 h 05 min) There are good views of the Valley of the Najerilla River with the Urbión Mountains in the distance. There is an open shelter, in a bad state of conservation, where it is possible to bivouac. Ignore the two trails on the right and continue straight on the trail to descend. Exit it on the right after about 10 minutes. Descend a small slope and take a path that continues parallel to the trail for a little while. Then, the path becomes a by-path and, above the Valley of the Rigüelo River, it continues descending towards the Najerilla River. Enter an oak wood and pass next to a fountain. You will reach a plain with pastures and the remains of a pen. Plain in the meadow (2 h 35 min) Leave the pen to the left and continue descending among pastures and trees. You will enter the oak wood again and descend a well-marked steep route that zigzags several times. After these zigzags, turn left and continue descending smoothly on a hillside route with great sessile oaks. Before exiting the oak wood, turn right and zigzag among the oak trees until you reach a lower route where you turn left. After a short stretch, turn right again and descend to a small fold. Cross it and, to the right, start a steep zigzag descent to the bottom of the Rigüelo Valley. Rigüelo Stream (3 h 20 min) Once you have reached the stream, turn left and descend to the beautiful valley on a well-marked path. 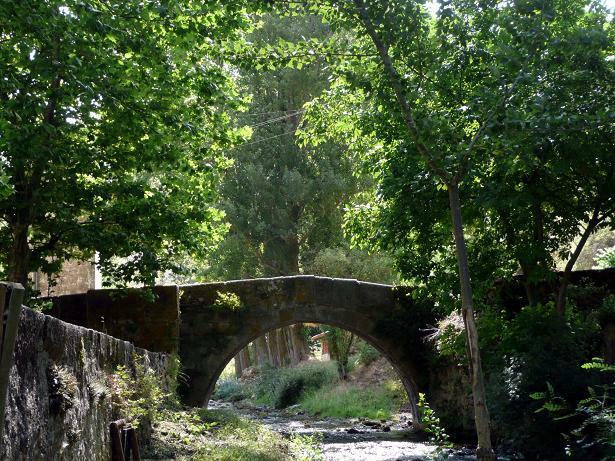 You will cross three footbridges and a bridge until you reach the regional road where you turn right towards Viniegra de Abajo. Follow the road and you will immediately reach Venta de Goyo. Venta de Goyo (3 h 45 min) Once here, leave the regional road and take the local road to Viniegra de Abajo and Ventrosa on the left. 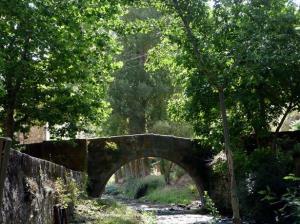 You will reach the road once you cross the bridge over the Najerilla River. Continue down the road. You will leave to the left the crossroads to Ventrosa and reach Vininiegra de Abajo. Viniegra de Abajo (4 h 30 min) End of the stage. Viniegra de Abajo (00 min) Exit the village on the upper part, taking the old path to Ventrosa towards the cemetery. A little after starting, leave the path and take another one on the left that leads to a warehouse and slightly turns right until it passes under the cemetery. Cross a small river bed and ascend a rocky area until you reach an electricity pole, from where you have a good view of the Najerilla Valley and La Demanda Mountains. Then, the path enters a Portuguese oak forest where you can also find maple trees. You will reach a fence that limits the town of Ventrosa. 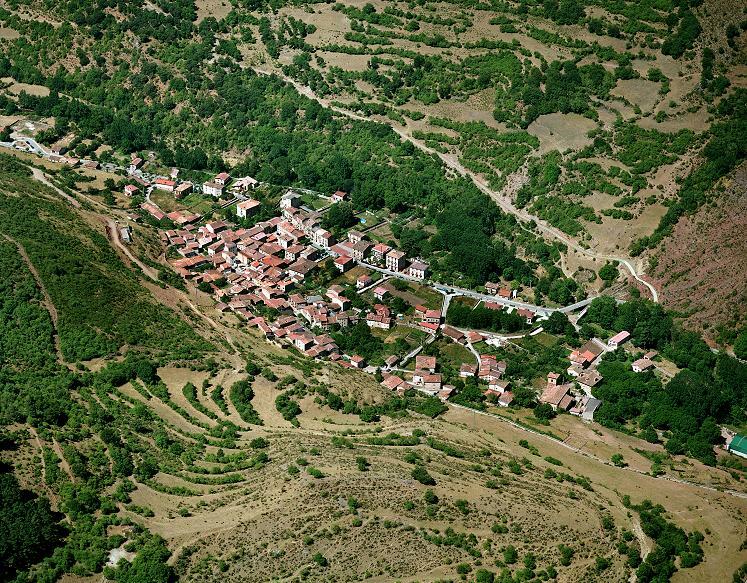 During a smooth hillside descent, cross a small ravine and, when you reach a pasture area, access the village of Ventrosa after crossing the bridge over a river with the same name. Ventrosa (1 h 08 min) Exit the village by the old path to Brieva, that starts at a trail next to two cattle pavilions. After the second pavilion, you will reach a fenced waste dump. Exit the trail on the right and take a path that ascends on the hillside. Follow the power lines at all times until you reach Brieva. Enter the trail again and continue on it through the bottom of the valley. After about 8 minutes, exit again on the right, cross the ravine and take a hillside path that goes parallel to the trail. The path leads to the trail again, on which you should continue until you reach a hill. There, turn slightly to the right and pass next to a stone boundary mark, known as El Palo. Collado de El Palo (2 h) There are great views of the Valley of Brieva and in the distance the hill of Canto Hincado, where you can find the path to Ortigosa. Start descending among pastures and turn left to descend a ravine towards a forest of Aleppo pines. At the bottom of the ravine you can see water flowing from a rock. After crossing the forest through zigzags and quarries, you will reach the bottom of the valley that leads into another ravine on the right. Connection of two ravines (2 h 20 min) Continue descending on a by-path towards the left at the bottom of the valley, parallel to the power lines. In some stretches, the by-path runs next to pastures and old croplands. You will reach the Barriuso district at Brieva. When you reach the Santa María Church, nowadays abandoned, turn right and access a bridge that leads to the road, where you turn right until you reach the centre of the village. Brieva de Cameros (2 h 47 min) Exit the village by the road to Ortigosa and, at about 200 metres from the last house, take a trail on the right. The trail passes over a cattle pavilion and goes up the Berrinche River towards Peñas de la Escalera. Route (3 h 07 min) Before reaching a quarry, exit the route and take a trail on the right that crosses the stream twice on bridges and passes next to a boundary mark. Border the quarry to the right and, when you reach a well-defined path, enter the gorge and ascend parallel to the river. The last stretch ascends with steep zigzags, called La Escalera (The Stairs), and reaches a shed. Shed at La Escalera (3 h 36 min) Ignore a route to the right, next to the latest construction, that is headed to Collado de Santa Cruz. Continue on a path that zigzags up towards the east and passes above a lonely holm oak. Keep ascending the rocky hill and, after a few wide zigzags, you will reach a pasture area. Continue towards the refuge by following a path surrounded by dense shrub vegetation. The Refuge (3 h 59 min) The path crosses a trail and passes under the refuge and the fountain, where you can see Brieva. Ezcaray (00 min) Start at the City council, in Avenida de Navarra, and go towards Valdezcaray. Cross the bridge over the Oja River and, in front of the old railroad station, turn right. When you arrive at a destroyed bridge over the river, leave the road to the left and go up a path. Path (08 min) In the ascent, ignore the detour that goes down to the right at the beginning of the path. After about 15 minutes you will reach a road. Road to Turza (24 min) Cross the road in the same direction that you are walking and, after ascending a slope, take a hillside route among repopulated needle leaf trees and beeches. After a zigzag, the path continues ascending the hillside until it becomes a by-path surrounded by repopulated trees that ends in a trail. Forest trail (1 h 10 min) Turn right to continue down the trail and a little after turn around towards the left. Ignore a by-path on the right. You will reach a crossing with another trail. Follow the trail to the left. You will see the village of Turza in the distance. 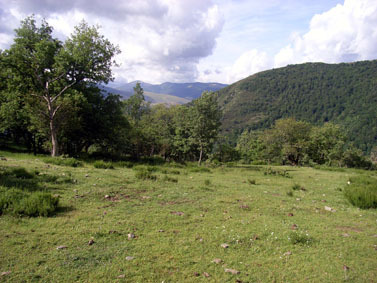 After exiting the forest, you will reach the hill Collado de Sagastia. Collado de Sagastia (1 h 31 min) Cross the trail in the direction you are walking and continue up, changing slopes on a hillside route that borders the Cerro de la Puerca until it reaches a small fold on a hill. In the distance you can see the peak of La Demanda Mountains. Hill (2 h 08 min) Continue up on a hillside route on the same slope, that crosses the upper part of the fold. It passes over an ash tree and a holly tree. Ignore the route on the right that leads to a beech grove. Right after passing a trough, the path ascends to the hill Collado de Márulla, where a by-path on the right leads. Collado de Márulla (2 h 26 min) Cross the hill and descend among pastures towards some rocks next to a trail. Take the trail to the right and, after 100 metres, exit the trail on the left. Continue ascending on the by-path on the right, ignoring the one on the left. Trail on the Majada de Márulla (2 h 32 min) Ascend on the by-path that borders the Cerro de Chilizarrias. You will see the village of Urdanta in the distance. After reaching a fence at the bottom of a hill, at the level of a fountain under the trail, exit the by-path on the left to access the hill Collado de Beneguerra. 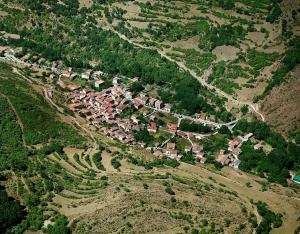 Collado de Beneguerra (3 h 06 min) Panoramic view of the Valleys of San Millán and the Oja River. After crossing the fence, in the boundary mark between Ezcaray and Pazuengos, go down to by-path and turn right. Continue on it, ignoring a path on the left. Before reaching a beech grove, the by-path becomes a route and goes into the upper part of the forest. It descends smoothly among Genista florida towards the Campos Largos ravine. At the bottom of the valley, you can see San Millán de la Cogolla. Campos Largos Ravine (3 h 44 min) Wade across the channel and cross the beech grove to continue on the hillside path. Ignore a route on the left before reaching a small fold. After this, you access a wide valley with a fence that you cross to continue on the hillside among moors, over some folds. The path reaches a flat area and borders the top part of a ravine to end up on a trail. Forest trail to Nestaza (4 h 29 min) When you reach the trail, turn left and descend it for about 12 minutes. Before a pronounced curve, exit the trail on the right, up a slope, and get back on the old path. Path to Saleguillas (4 h 41 min) Continue the walk among beeches, pass a quarry and wade through a ravine among rocks after descending. Continue on the hillside on the top part of a beech and birch forest until you reach a hill with a fence and a gate.